Metal-finishing company Surtech Industries, York, PA, has installed a semi-automatic Tornado orbital-wrapping machine, TAB Wrapper, that has accelerated production in the shipping department and cut labor costs in half. Replacing manual stretch wrapping, the Tornado enables one person at Surtech to safely wrap the company’s metal bar stock, long tubular material and a variety of polished metal components often spanning 10 ft. feet or longer directly to a pallet in 1 min., compared to the manual 5-min. pallet-wrapping process previously employed. The TAB Wrapper Tornado automatically wraps plastic stretch film 360 deg. 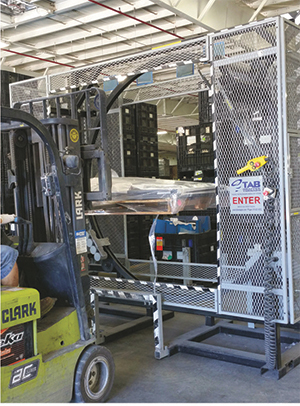 around and under an entire pallet load to create a unitized, secure load that also protects the finished products from weather, warehousing and transportation operations. Surtech has documented savings in labor that translate to a return on investment of less than 2 yr., according to company president Terry Spisak. Spisak ordered the 100-in. Tornado model with a wireless automation package combining an automated cut and wrap device and handheld wireless remote control that allows lift-truck drivers to operate the wrapping machine without leaving their seats.